The terminally ill woman whose court case began the ongoing cervical cancer screening scandal has said that she does not believe 'for one minute' that the head of the HSE Tony O'Brien only heard of her case on the news. 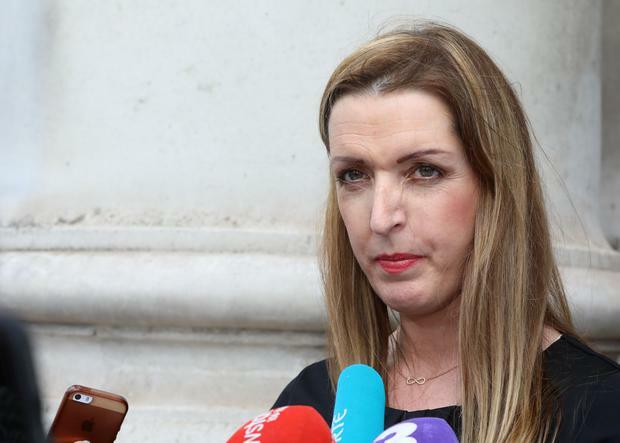 Vicky Phelan was on RTÉ's Prime Time on Tuesday night to respond to the revelations in the Dail tonight that the scale of the scandal is larger than previously thought. During her appearance Ms Phelan also questioned Mr O'Brien's assertion that he only heard of her case via news reports. "I don't believe that for one minute to be honest. I mean he's the Director General of the HSE. I cannot see how he could not have known about this before then. So I don't believe that," said Ms Phelan. O’Brien was head of the National Cancer Screening Programme when smear test analysis were outsourced to the United States in 2008. Despite now being the head of the HSE which oversees CervicalCheck, Mr O’Brien has claimed he only learned of the Vicky Phelan case from media reports. "I'm not surprised to learn that," Ms Phelan said. "The numbers have been changing on a daily basis. Disappointed and disheartened but not surprised," she added. "I think this is a huge patient safety issue and the memo that came out today, I think that is the biggest problem that I or my solicitor has with it. "This is a massive patient safety issue, look what has been uncovered because of it. So this memo, either people didn't know the extent of it, and I find that hard to believe or they just thought this was going to go away, to be honest, and that I wasn't going to preoceed. Ms Phelan also revealed that she received a phone call from the Taoiseach's press secretary. "He was asking would I like to meet with the Taoiseach. The Taoiseach has offered to meet with me privately, so I said yes in principle, but at the moment I'm trying to concentrate on my health and I have a lot of treatments coming up this week, so I told him I'd get back to him," Ms Phelan said. Ms Phelan also encouraged women to continue to go for smear tests, saying some side effects to the treatment of the cancer result in women being unable to have children. "It's a horrible cancer to get from the point of view of the side effects after treatment, for younger women in particular," she said. HSE boss Tony O’Brien’s position will be defended by the Government today in the face of growing calls for his resignation. Political pressure came on the outgoing director general of the health service yesterday – but sources indicated ministers will continue to express confidence in his leadership. Sinn Féin’s health spokeswoman Louise O’Reilly argued his position is untenable in the wake of Vicky Phelan’s High Court settlement for €2.5m. “Surely the nature of the case and the cost involved would have sent alarm bells through the HSE, the Department of Health and up to the level of Government,” Ms O’Reilly said. Taoiseach Leo Varadkar said calling for Mr O’Brien to be sacked because he was linked to the outsourcing of tests was not reasonable. “Everyone, even Tony O’Brien, deserves a fair hearing before being condemned. We need to assess whether that decision was wrong. It may turn out not to be wrong. We need to be fair about it in that regard,” he said. As the scandal deepened further, Health Minister Simon Harris faced over three hours of questions in the Dáil. Much of the debate focuses on a briefing note received by Mr Harris on April 16, three days before Ms Phelan’s case came before the High Court. The minister said he received it at 7pm and didn’t read it until the following afternoon because he was attending ministerial and Cabinet meetings. He told the Dáil that having read the note he had reached the conclusion that Vicky Phelan had an individual case and there was no wider risk to patient safety. The note states: “The outcomes of all current and historical clinical cancer audits were subsequently communicated to treating clinicians in 2016 (including this case). Mr Harris was also briefed that the State Claims Agency was of the view that solicitors for the US-based MedLab/Clinical Pathology Laboratories Ltd “will endeavour to settle the case on the best possible terms”. “In its view the case is likely to be settled shortly before going to court. Fianna Fáil’s health spokesman Stephen Donnelly said Ms Phelan had “laid bare a conspiracy of silence”. “Many other women kept in the dark will now be told the truth,” he said. Mr Donnelly also questioned why the minister didn’t make any follow up inquiries after receiving the note. “People are scared. People are furious about what has happened,” he said. Independent TD Dr Michael Harty said the health service had allowed “process trump the patients”. “Quite often it is the cover up of the issue that attracts the attention rather than the original mistake,” he said. Yesterday, Health Minister Simon Harris revealed in the Dáil that a “potentially considerable number of cases” where women developed cancer were not subjected to an audit. It was believed that all existing smear tests were re-examined as a matter of practice if a woman was later diagnosed with cervical cancer. However, the Serious Incident Management Team (SIMT) sent into CervicalCheck since Vicky Phelan settled her case has discovered that not all cases were examined. Mr Harris said he did not have “specific figures” but agreed with Fianna Fáil’s Stephen Donnelly that it could be in the region of 1,500. Records from CervicalCheck show that 1,482 cases were reviewed since 2008. Of these 208 were showed to have ‘false negatives’. The revelation suggest another 1,500 will now have to be studied. The HSE has said in a statement that approximately 3,000 women In Ireland have been diagnosed with cervical cancer since 2008, and approximately half (1,482) of these cases were notified to CervicalCheck. The HSE SIMT is working with the National Cancer Registry to see if any other women who have had cervical cancer should be included in the audit of historical screening tests and anyone affected by this will be also be contacted. They said they will provide further information and updates over the coming days on cervicalcheck.ie and anyone with concerns may contact the CervicalCheck information phone line on 1800 45 45 55.